Believe it or not, until now, the company had not maintained a directory of its merchant partners, which includes both brick-and-mortar stores and online sellers. But there are 15,000 businesses in the U.S. where you can pay with Dwolla, and today’s launch aims to better highlight those merchants. 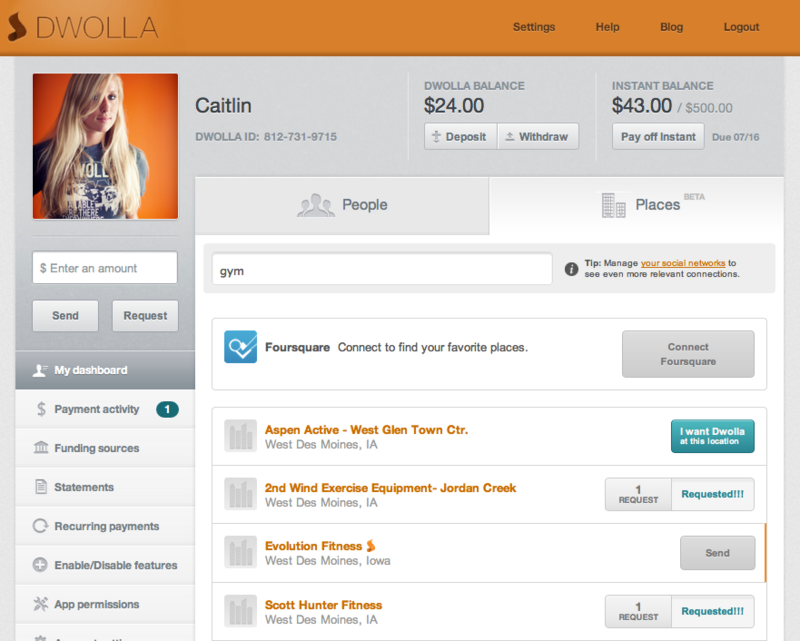 “For the first time, you can actually search for where you can use Dwolla,” says CEO Ben Milne. But he admits, “There are 25 million businesses [in the U.S.], and Dwolla isn’t everywhere you want to use it yet.” That’s why the new “Places” product allows customers to also request Dwolla support by clicking a “Want” button next to the merchant where they’re hoping to see the service implemented. Dwolla will then begin using these votes to better target which merchants it starts talking to next. “That way, when a merchant comes online, they already have customers ready to go,” says Milne of how the change will impact Dwolla’s merchant outreach. “And then we have a mechanism for telling those customers that the merchant you want to use Dwolla with is now online,” he adds. He says customers will be alerted to their requests via email notification. The new feature also comes with social sharing options, allowing Dwolla’s more rabid fan base to campaign for votes via Twitter and Facebook. 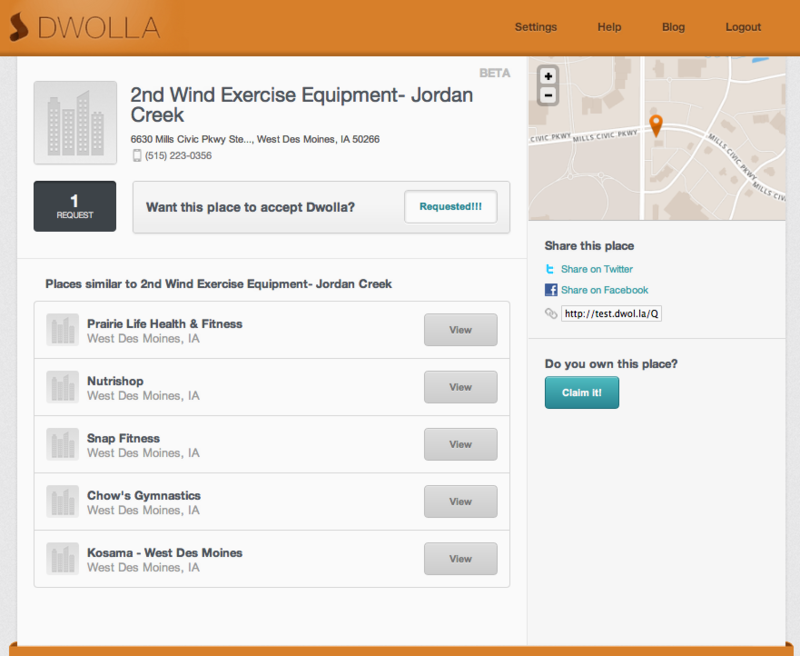 You can also connect to Foursquare to see if your favorite check-in spots already support Dwolla. And merchants who discover they’re starting to get votes can “claim” their profile page following a short verification process. Meanwhile, for existing Dwolla merchants – which Milne says are largely brick-and-mortar retailers – the “Places” feature means improved discovery through public profile pages. But users won’t have to just know the merchant by name – you can also search for generic terms like “coffee” or “auto body,” for example, if you want to support Dwolla-friendly businesses. The feature is currently in beta, so it may be buggy, the company warns. It’s also currently available online online, but mobile app integration is in the works. However, Milne says that Dwolla is working on a larger update to its mobile apps which will include a redesign to support “Places,” among other things. “It’s likely that you’ll see some similar structure extended into the mobile apps,” he says. But that update may not come immediately. Internally, Milne says the thought process around mobile, where apps haven’t been updated in half a year or more, is: “let’s not do a marginal update, let’s do something meaningful here.” Stay tuned.